FREE SHIPPING on purchases of 4 CGC books for US buyers! 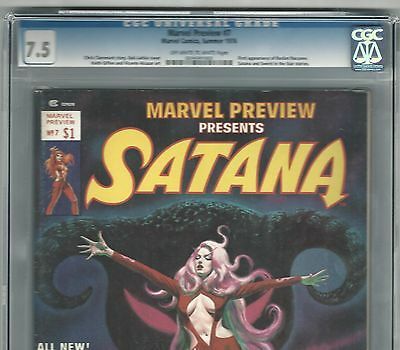 You are bidding on the actual graded comic book shown in the scans. See CGC label for condition. This 1st printing comic has just arrived from CGC and is stored in a clear mylar bag for maximum viewing pleasure. See digital pictures/scans of the actual comic that you are bidding on. Please excuse any reflections, shadows or uneven coloring created by my scanner. Check our Ebay store for more graded and raw issues of Marvel, DC, Walking Dead and other comics! We also buy collections of graded and raw comic books and original artwork. Payment: Payment by direct credit card or Pay Pal is due within 3 days of auction ending or immediately with Buy It Now option. Contact me to discuss any other payment options. Multiple Auction Wins: Place items in your cart and request an invoice for combined shipping. We are glad to combine similar items to save you on shipping costs where possible. If multiple Buy It Now purchases require immediate payment, we will refund any excess shipping fees paid via Pay Pal when we process your order. Shipping & Insurance: Each graded comic is shipped inside of two bubble envelopes which are then double boxed for maximum protection. Items are shipped insured from my smoke-free home. The shipping and handling fee includes insurance and signature confirmation (when required by Pay Pal). 4 graded comics = Free shipping in the US! 5 or more = fee based on actual weight and zip code and will probably be shipped by Fed Ex. International: All other countries will ship via USPS Priority Mail International. Shipping fee is based on weight and country with insurance. Contact me for an estimate if needed. Satisfaction guarantee: We want to earn your 5 star vote on each rating category! If you are not happy with your transaction we will gladly refund your full purchase price. Please email me to discuss any returns prior to leaving any feedback. Any Questions? Please ask any questions prior to bidding. Please add us as a favorite seller and sign up to receive our email notifications for special sales! Want to get daily alerts for our new listings on Ebay? It's easy! Just follow these simple steps: (1) Type "Primo" in the Ebay search bar. (2) Select "Collectibles from the drop down box on the right-hand side. (3) Click on the "Search" button. (4) Select "comics" from the directory on the left-hand side of the page. (5) Click on "Follow this Search". (6) Congratulations!! You should see a pop up window confirmation stating that you will begin to receive daily updates for this search!